Samsung’s Tizen operating system, written in C/C++ programming language, currently has 72.5 million lines of source code, out of which Karpov’s team has analysed some randomly chosen modules i.e. 3.3% of the entire Project and found nearly 900 errors. “If we extrapolate the results, we will see that our team is able to detect and fix about 27000 errors in Tizen,” Karpov says. In April this year, Israeli researcher Amihai Neiderman called Tizen “the worst code I’ve ever seen” after he examined the operating system and discovered as many as 40 zero-day vulnerabilities in Tizen code. “We are already aware that another tool can find additional defects. 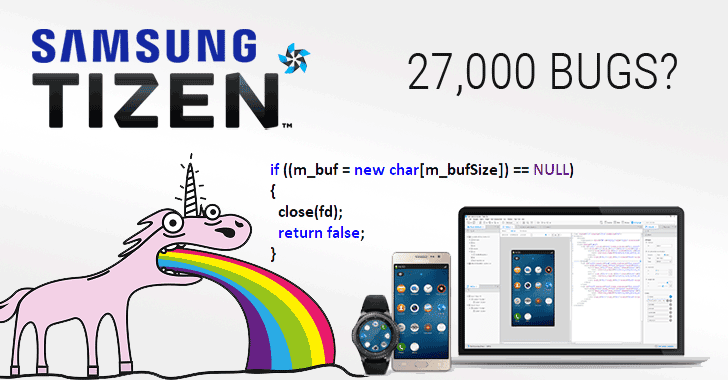 However, we don’t agree with that Tizen has 27,000 defects that should be fixed. As you know, many of static analysis warnings are often considered as insignificant issues,” Kim added.